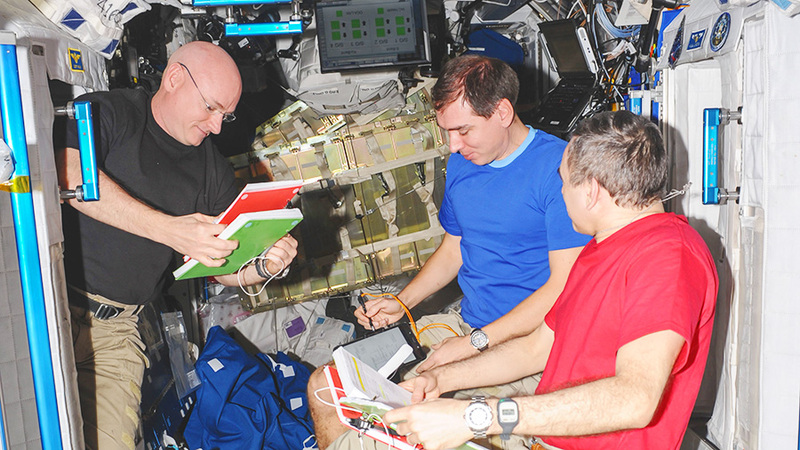 ISS045E020492 (09/22/2015) — NASA astronaut Scott Kelly (left) and Russian cosmonauts Sergey Volkov (center) and Mikhail Kornienko (right) review procedures aboard the International Space Station. The deployment of two Cubesats is on hold after they failed to eject a couple of weeks ago. Also, more spacesuit servicing and biomedical investigations took place today. The deployer mechanism that ejected 14 of 16 Cubesats is back inside the Kibo laboratory module’s airlock. Two of the Cubesats did not deploy due to a secondary latch mechanism that hung up inside a deployer slot. Japanese astronaut Kimiya Yui scrubbed cooling loops inside the spacesuits that NASA astronauts Scott Kelly and Kjell Lindgren will wear on two upcoming spacewalks. Lindgren also collected and organized spacewalk tools he and Kelly will use during the Oct. 28 and Nov. 6 spacewalks. The duo will exit the U.S. Quest airlock to service and upgrade hardware outside the International Space Station. Cosmonaut Mikhail Kornienko joined Kelly, his One-Year crewmate, and Lindgren for Ocular Health eye exams in the afternoon. Veteran cosmonauts Sergey Volkov and Oleg Kononenko partnered up for two different experiments. They first studied heart and lung activity in microgravity then moved on to exploring using sound waves to determine the location of micrometeoroid impacts.